How appropriate that Pindar's Olympic Ode is quoted at the opening of the Greater London Authority's Olympic Legacy Supplementary Planning Guidance . Well! these are tales of mystery! You might think that some nine years after businesses and residents were forced to leave the Olympic Park that all outstanding compensation claims would have been resolved. Not so. A recent Freedom of Information request to the Mayor of London showed that three businesses, Brewsters Waste Management, Clearun and McFen Haulage, are still pursuing claims. Elsewhere, at least one Clays Lane resident is still trying to sort out an expenses claim while others who were wrongly told they were not entitled to be rehoused are still waiting for their rights to be recognised. Of course, time limits apply. In fact not just time limits but even if, as in one case, a claim was made before the six years were up the Greater London Authority (GLA) takes the attitude that failure to resolve, not apply for, compensation within six years means they will impose a settlement whether the claimant likes it or not. In the case of disturbance expenses the GLA refused to send a promised letter to Clays Lane residents, despite being repeatedly asked to do so, informing them of their right to claim expenses if they spent over the standard amount. Many were unaware of this right as the policy changed during the removal. Assembly members do not argue for claimants but support the GLA. In addition wrongful deductions from compensation  paid to Clays Lane residents have still not been repaid. The London Development Agency (LDA) avoided having to answer Freedom of Information requests on reasons for such deductions by sub-contracting the payment of compensation to Peabody, which is not a freedom of information organisation. Other groups 'relocated' for the Games have been left stranded after being made legacy promises. Manor Gardens Allotment holders had an agreement  to create a new set of allotments at Eton Manor, for which planning permission had already been granted, overturned as a result of a conspiracy  between Waltham Forest Council and the Lea Valley Regional Park Authority, while the travellers who used to live at Clays Lane find themselves living in a substandard site on the edge of the Olympic Park, which they understood was to be temporary, instead of returning to the Park. There is nothing surprising about this state of affairs. Compulsory purchase is a brutal process. Power is in the hands of the purchasing authority which declares what it will pay. Agreements are broken at will by successor organisations. Sometimes after long negotiation compensation is driven up but if the authority digs in its heels then it requires legal action to try and improve the terms. A local businessman, Lance Forman, described his experience of dealing with the London Development Agency (LDA) in this interview . His story is typical of those facing the LDA. Clays Lane residents were told, when London2012 first came to talk to the community at the end of 2003, that the estate would be demolished even if the Olympics didn't come to London. They even brought a diagram showing an alleged 'non-Olympic' scenario. The only trouble was this was a lie as the LDA acknowledged when a Freedom of Information request was made and they responded saying there was no plan. The answer to all queries about compensation is that it is decided on the basis of the 'compensation code'. The reality is that for the Olympics compensation was offered on the basis of argument, resistance and negotiation. For example, at Clays Lane initially the discussion was about the basic home loss payment which back in 2006 was £3,800. In fact, the figure first suggested was £3,500. No mention was made of disturbance payments. After a while these initial statements firmed up into an offer of £6,000. However, residents refused to accept this and gradually the disturbance payments were raised, a payment was included to take account of the substantial rises in rents, service charges, council tax and utility bills and there was even a small payment for loss of amenities. Others had similar experiences. A local church was initially told it would get nothing as it had a short lease. Then after prolonged argument with the assistance of a lawyer they were eventually offered some money. The same happened to the Manor Gardens Allotment holders who were first just told to go somewhere else with no compensation or a replacement allotment. Some did indeed leave and never got anything. Only after the allotment community organised to oppose this atrocious behaviour were offers made of a new site and a small amount of compensation. The travellers at Clays Lane were first offered a minuscule amount of money. Only when they heard what residents were being offered was this money increased. They were originally offered a completely unacceptable site in Beckton which they had to argue against before finally being given a site near the Olympic Park. Even this turned out to be poorly costructed and promises about a return to the Park never materialised. Businesses with expiring leases were given nothing, even if freeholders said they would have extended the lease. Some companies have continued to battle for a fairer deal. The case of Rooff  reveals how long it took one company to challenge its original valuation. Other companies are still arguing. Rooff contended that it would have been able to develop part of its site for housing. It took a legal battle and a new inspection to get the original valuation overturned. In the end their total compensation, including fees, was more than doubled. The companies still battling years after Rooff won its case are also claiming that their land could have been developed for housing. A number of other significant landowners has been waiting to see what the outcome of the case is. It is likely that Newham will now accept that other sites coming forward in the area now should receive a Section 17 award enabling resi development, leading to a likely substantial increase in the government compensation for sites compulsory purchased to make way for the Games. The section17 certificate is simply a certificate issued by the local planning authority stating that, in the absence of the compulsory purchase scheme (in this case the Olympics) then the planning authority would be minded to grant a planning consent on the basis stated in the certificate. Neither planning consent nor a section 17 certificate makes the land more valuable than its existing use because the value is created by demand for that use in that particular area. It is correct that Rooff managed to secure a certificate, but that itself did not create value. It was successfully argued in the Clearun case that while we accepted residential uses on their site (which was close to the Rooff site), conditions were not acceptable for residential development to take place at the valuation date. We successfully argued that, until Stratford City and Westfield commenced, the demand for residential land was “not there” and any development for residential purposes, in the Clearun case, would not commence for at least 7 years after the valuation date. Due to the location of the Rooff premises, it would be at least 7 years if not longer as the ripple effect took place. The reality is that Rooff did get a Section 17 award changed and the three remaining companies are also involved in arguments over Section 17 awards. To have a designation that a site is suitable for residential development is plainly significant. The argument 'value is created by demand' is interesting given the way in which demand is manipulated during the runup to a major project like the Olympics. The process of compulsory purchase for a project like the Olympics involves deliberate lying in order to drive down the price of the land and thus the compensation to be paid. Planning designations and permissions dry up in the area. In the case of Mr Forman, he couldn't find a replacement site for his fish smoking factory. He was determined to stay in the area. However, as an example of how the Olympics was impacting on planning permissions for other businesses, the LDA found that a housing developer was unable to get permission to build on a site on Fish Island, opposite the stadium, as Fish Island North had been proposed as a possible site for the Athletes' Village. This plan did not come to fruition as the Village was sited at the north end of the Stratford City site. However, the developer still couldn't get planning permission so the LDA offered the developer a site elsewhere so that Mr Forman could move his factory to Fish Island. For London2012 the quality of the land, its uses and its future prospects were all belittled. The Olympic Park was described as a 'scar' and an 'urban desert'. Ridicule was heaped on it because of the presence of a 'fridge mountain' . Of course, fridges need to be stored somewhere and the gases need to be extracted to render them harmless, all very sensible and desirable activities perfectly well suited to an industrial area and not deserving of ridicule. This perception that the land was valueless and that Stratford was a development black hole  was carefully nurtured in the media so much so that it became embedded in the public consciousness. When people were taken to view the area from Newham's tower block at Holden Point the land in front of them was not the Olympic Park, as Mr Forman points out in his interview , but the mud pile that was the old Stratford Rail Lands, later to be Stratford City, as in the first image in this article from the Daily Mail  with the picture being borrowed from the Evening Standard, a double media failure. This land was being raised with the subsoil from the Channel Tunnel. Yet London2012 would happily and deceitfully present this totally empty space as part of the Olympic Park when in fact it was a separate area. Likewise when Clays Lane was being argued over for the Compulsory Purchase Enquiry the LDA described it, and the neighbouring Park Village student estate, as being in poor condition, even though the housing was entirely sound and Clays Lane was only 25 years old when demolished. For the most part, particularly in the early stages, the media played along with the Olympic project, often simply regurgitating London2012 press releases, a particularly striking example of this uncritical repetition of lies by both journalists and academics was the claim that London2012 would create the 'largest new urban park in Europe for 150 years' . Once again Mr Forman makes the same point when he describes how stories about his battles  with the LDA would just dry up. He was of the opinion this was a deal between the promoters of the Games and editors who did not want to damage the Games' prospects. industrial development continued from the 1950s onwards with confectionary, fur trade, engineering and fruit businesses, as well as timber yards and warehouses continued to make the area a real hive of activity and industrial innovation. ...changed the character of the area to one of predominantly employment use, with a subsequent decline in the density and type of employment. The reality is that the industrial lands in the Olympic Park were always extremely valuable. They are situated right next to one of the busiest rail terminals in London and are only a couple of miles away from the City and from Canary Wharf. Newham had been planning the development of the Stratford Rail Lands next to the Olympic Park since the early 1990s and this project, Stratford City, was maturing just as the Olympic bid was launched. Stratford City was a £4billion development project which was going to greatly increase the development potential of the industrial land nearby. This had nothing to do with the Olympics , but the national news media  has consistently bought into the absurd notion that Stratford City somehow depended on the Olympics or was even an Olympic project. In reality, exactly the opposite was true. It is true that there are small shoots of regenerative development across the area. However, that represents a very limited response to years of promotion through planning policies; and there is no reason to suppose that a long-term piecemeal approach could realise the projected benefits. Objectors contend that Stratford City will be a major focus in its own right and it does not need the Games. In this regard, Stratford will bring the major transport infrastructure to serve the Games; but the Games, through the CPO, will provide the necessary infrastructure to allow that development to be delivered (6.2.74). In reality this argument was nonsense. The reference to transport infrastructure is simply extraordinary. Even for Stratford City the transport infrastructure was already in place. Stratford station had been built at the tail end of the City Challenge programme years earlier. The only new line being created at that time was the Docklands Light Railway (DLR)  linking Canning Town to the so-called International Station. Even that was already planned and ready to go. The Jubilee line was up and running as was the DLR to Canary Wharf, the Overground, the mainline to Liverpool Street and up into Hertfordshire and East Anglia, the Central Line had been in place for years while even the Stratford 'International' Station and the Channel Tunnel line to St Pancras and out to Kent was already built. We have been working very successfully with the Stratford City consortium for many years and we are confident the project will deliver huge benefits to East London: thousands of jobs, homes and community facilities. It was not the Olympics that Newham was relying on but Stratford City. Having sided with the Olympics the Inspector does not describe the 'necessary infrastructure' that the Games would bring. In fact the opposite was true, Stratford City provided connections for the Olympics not the other way round. 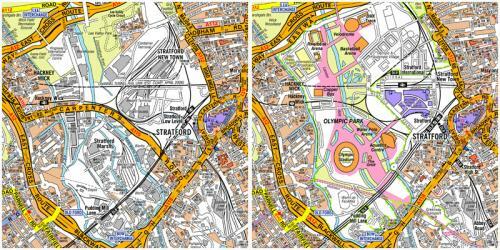 If Stratford City had not been in place London2012 would have had to build all the routes into the Olympic Park. Instead it just had to make modifications to what was already designed. What might be termed 'piecemeal development', in the form of permissions for blocks of flats and the massive Stratford City development and in most cases their construction, was well established by the time the CPO Inquiry was held in the summer of 2006 so these assertions were simply bizarre. It was impossible to challenge these ridiculous statements when Clays Lane residents took the matter to judicial review as all the Government had to show was that the Inspector had considered the various issues. The correctness or stupidity of his findings was not up for discussion. Journalists have also fallen for the idea that the blocks of flats built along Stratford High Street  are all part of the Olympic legacy. Nearly all these developments  had planning permission before the Olympic bid was won. They had been planned from the early 2000s or even the end of the 1990s and many were completed before the Olympic facilities were built. They were part of the Stratford City effect, Newham's drive to develop the Rail Lands, not the Olympics effect. Businesses inside the Olympic Park were sitting on land criss-crossed by rivers and canals, just the sort of sites which developers wanted to build on. As stated, outside the Park this was already happening up and down the River Lea and on the banks of canals. The same process would have happened inside the Park allowing for the retention of much of the industry at the same time as housing was built, exactly what Rooff showed in its later argument with the Olympic authorities. Housing development land is worth far more than industrial land. One Olympic Park businessman put it at eight times the value. In due course many of the sites within the industrial area would have been sold off for housing development. Not only was the land undervalued at the time but the values of the land were going to rise in line with the developments occurring in the area. This is what the landowners in the Olympic Park missed out on. The Olympics deliberately curtailed these values and fixed them at a certain level which completely failed to recognise their longer term potential. This battle for compensation is just part of the story of how the Olympics caused massive damage to Stratford and its development. Without the Olympics development would have occurred in such a way as to enable the retention of local 'dirty' industry even as housing development would have happened alonside it. Other communities like the allotments, Clays Lane, the two travellers' communities would have been retained. So would the very well used Eastway Cycle Circuit. The 5000 jobs on the Olympic Park site  would have been retained for longer and new industry would have been introduced. The Carpenters Company was apparently also planning a community masterplanning exercise for its land within the Park area when the Olympics intervened. Instead a top down demolition was imposed on the area. Land which could have been used for housing or industry was lost to stadiums of little use to local people while most of the jobs yet to be created will be out of their reach. Almost four years on and no housing is yet ready inside the Park and the housing which will be built will be unaffordable for all but a few Stratford residents. For example, at Chobham Manor, the first Olympic neighbourhood now under construction, £115,000 will only buy a 25 per cent share of a one-bedroom flat under the so-called 'affordable' part rent/part buy scheme . This totally undemocratic development model  is now being advocated as the template for further programmes. This was an enormous area of former industrial land. But while Stratford City, the rail lands on the right hand side of the map below, is a much smaller space it is expected to host around three to four times as many jobs and almost as much housing as the Olympic Park and and includes the Athletes's Village, now East Village, the Westfield Mall and the International Quarter. This is an astonishing waste of good land. Bringing the Olympics to Stratford not only removed valuable jobs from the area damaging the economy for local people but it wrecked a path for its development which would have better served local needs. Instead the lie that the land was valueless and a wasteland was used to justify a land grab. The Convergence Agenda had been intended to prevent the Olympics being a repetition of the Docklands disaster which brought few if any benefits to the local population. In reality, this 'Agenda', according to which the Olympics was supposed to deliver a legacy through the regeneration of 'an entire community for the direct benefit of everyone who lives there’, was dead before it was even written as this destruction of local industry had radically skewed the possibility of a 'legacy' for local people. Far from avoiding the Olympic Park becoming an 'island of prosperity'  this was its only possibility.